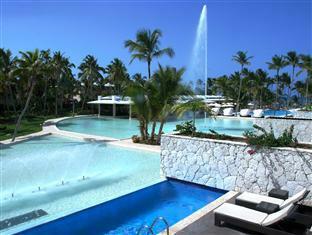 ﻿ Best Price on Catalonia Royal Bavaro All Inclusive in Punta Cana + Reviews! Have a question for Catalonia Royal Bavaro All Inclusive? This all-inclusive, adults-only resort is located on half a mile of coral sand beach, overlooking the spectacular ocean. The resort is 20 kilometers from the airport and 15 kilometers from the commercial center of Punta Cana. The Catalonia Cabeza de Toro Golf Club is on-site, and guests also have access to a casino. Guests can enjoy a number of land and non-motorized water sports and dance the night away to live music. The resort's seven restaurants offer international dining, and 24-hour room service is on hand to satisfy a midnight craving. Laze in the sun on the resort's private beach, play a few games of tennis, or relax in the hydro-massage shower at the spa. Whether looking for an active vacation or the chance to nap to the sound of the waves, Catalonia Royal Bavaro All Inclusive promises an unforgettable experience. The resort itself was very beautiful. The rooms were nicely decorated and spacious, but all of the rooms (3) we occupied smelled strongly like mold. Four out of the 5 days we stayed there the shower water was freezing cold and we had to call maintenance. They would fix it that they and the same thing would happen the next day again. The staff was not very friendly, they barely smiled. We think it was mostly because of their language limitations. Don't go if you don't speak Spanish because they don't speak any ? And that goes for 90% of the staff, starting at check-in all the way to the maintenance staff, it was very frustrating if you wanted to tell them about problems you were having. The quality of the food in the restaurants was very mediocre. Overall stay was superb except for the quality of services... most of them looked tired and sometimes a bit snobbish. We understood this is a beach hotel thus everything should be "cool" but too much of it can be annoying as well. The food is so-so.. please, it's an all inclusive - people don't have any choice but to eat.... but make sure it's worth what we're paying for. Room service normally deliver the food an hour and half later.... longest I've had. Urggh! Our 1st impression of catalonia was not very positive, because the property in itself is not very grand. The reception is small & the building is small. We were given a room near the beach & we were absolutely depressed with the room. Mouldy smell, no internet, ac making a noise. So we called the reception a couple of times & they quickly arranged for de-humidifier & AC mechanic. In a couple of hours, that was taken care of, but the reception offered to move us in a new room. So we checked the new room, which was simply fabulous. Large room with agood toilet & bath & the tub was next to our bed in the bedroom. The room has a small sitting area before the balcony. The view was great of the pools & the forests outside the resort. The FOOD is AWESOME in this resort. There are 3 restaurants in this property & 5 other in Catalonia Barcelo (included) just walking distance from Royal. The 3 restaurants within Royal are exclusive fine dining restaurants, not the all inclusive pizza, burger shiyt that the other 5 in the neighbouring resort offer. The Spanish restaurant has great food, good environment & great staff. The beach is small but isolated for adults. The sea is calm for anytime swim, though has a bit of weeds in it. The food & the service is unmatched. The rooms are luxurious. The Catalonia next door is included in Royal Catalonia as well. we really enjoyed our stayed with you however prior to arriving we spent 10 days in catalalonia in baya hibe and found that the entertaiment there was amazing compare to the your entertaiment the staff there were great and very very friendly always around talking to us daning ect i really think that there are a lot of things that your entertaiment staff could learn from this hotel. There is very little to do at your hotel. More fun activities should have been planned for quests throughout the day. Restaurants should open earlier for breakfast,lunch and dinner. The service at all the restaurant are so slow. The hostess takes forever to sit us at our table even though there were empty tables. My husband went diving at your resort and the dive equipment almost killed him. The equipment is not to acceptable diving standards. We had a hard time getting beach towels. This is a beach resort. Beach towels should be replenish in the room everyday. The walking conditions throughout the hotel is hazardous as they were slippery everywhere. I have a knee problem and I have put so much stress on my knee just trying to be careful walking on the slippery floors around the hotel. The only thing I enjoyed at your hotel is your spa facility. Martha is awesome. I had 3 spa sessions with Martha during my stay at your hotel. Lovely place with very good general distribution. Adults only makes it very quiet. If you like to have some noise and activities, Ample swimming pools and nice beach. Comfortable and well sized rooms. Good restaurants, all "a la carte", sufficient space, no queues, no reservation required. the hoel felt relatively new. the front desk staff was helpful and friendly. the hotel got a private beach with a bar and juice place, beach it self is lovely with white sand and palm trees. there are two pools, both close to food and bars. there are multiple restaurants one the royal hotel and the non royal side witch you also can use, the restaurants are aver all ok. our favorites were sea blue for lunch (there dinner is also nice) and the tapas restaurant, on the non royal side the mexican place was nice, the japanese were more of a show then good food but we had a good time there. The physical estate is top notch. The same for the food. The assistance at the réception and Room service: not very professional. Smoking and hard, very hard beds, loud people - mainly from Canada rude people - mainly from Russia, air con needs to be addressed but our main complaint was the smoking everywhere! The willingness and courtesy of the staff was second to none. Staff were 99.9% wonderful with the exception of a large young lady who was supposed to greet us in the Tapas Restaurant and made the whole atmosphere very miserable for the staff and holidaymakers on only one night. Our main gripe, as British holidaymakers, who are in the minority, was the amount of smoking in nearly all the areas. Even where no smoking signs are put on tables in the foyer, people smoked and to sit out and dine or even have a drink outside the piano bar was very uncomfortable. If you are wondering why we didn't complain. We were so obviously in the minority and Dom Rep relies on tourists purchasing cigars etc. Overall, service with a smile, quality of food exceptionally good, the only niggle being that it was difficult to get a hot meal, it was normally tepid which is such a pity as the quality of all the food was lovely. Would not return because of smoking, hard beds, air con not equal to the hot conditions but the staff could not do enough for you. chambre immense, bien propre, bien équipée mais quelques désagréments avec un jour l'eau chaude en panne , un autre le sèche cheveux hs.... désagréments qui il est vrai ont été très vite réparés. le personnel est efficace mais pas très souriant que ce soit dans les chambres ou ds les restau.